Spikes Hedgehog Food has been a massive hit with my local hedgehogs. I had no idea how irresistible the hogs would find it. They look healthy, they’re visiting as often as ever and by the amount they are eating they must be putting on weight too! 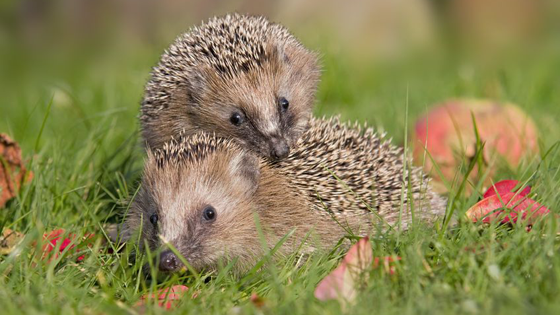 Hedgehogs have just been voted the UK’s national species but they are in trouble. They need our help. Hundreds of thousands of us feed hedgehogs in our garden every evening but are we doing the right thing? Could we do more? I’ll be trying to answer these questions and more across various parts of the website over the coming months but in the meantime let’s ask ourselves a question – Commercially available hedgehog food, is it just a money making fad or a perfect nutritious supplement to a hedgehog’s diet? I try the Spikes range of hedgehog food in the Gadgetman garden to see if I can help answer the question. Hedgehogs have got to be one of my favourite garden visitors. I’m lucky enough to have several visiting throughout summer and autumn and I’m hoping one or more will decide to take up residence in in one of the six new hedgehog homes I’ve strategically placed around the garden. For the past eight years I’ve been popping out a small amount of food each evening for my night time garden visitors and I’ve spent many wonderful hours watching the antics of those visitors via my network of wildlife cameras. There’s been tears, there’s been laughter and there’s been moments of eye popping disbelief at some of the things I’ve seen! The menu usually consists of a mixture I knock up myself consisting of a crushed fat ball, sunflower hearts, dried mealworms, kibbled peanuts and a small amount of a general bird seed mix. Occasionally I’ll add some leftover chicken or a small amount of cat food. Over the past several months I have noticed the increasing popularity of ‘specially formulated’ hedgehog food via social media (Twitter, Facebook etc.) but to be honest have always been a bit skeptical. Was it a ‘specially formulated’ food designed especially for hedgehogs or was it just the latest idea from various marketing departments rebadging cat food to appeal to the thousands of hedgehog lovers around the UK? The packaging on both the dry food and the semi-moist is great. Bright, colourful and jammed with useful info on the back. The semi moist bag is particularly useful has it has a zip lock top so will help keep the food in tip top condition for an extended period. The bag for the dry food doesn’t have a zip lock top unfortunately so you’ll need to pop the food in an air tight container once opened. Maybe the dry food packaging will be modified in future batches to include the zip lock top, we shall have to wait and see. 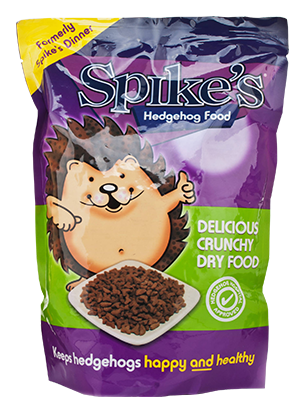 Spike’s crunchy dry food is a chicken based food designed for hedgehogs of all ages. Ingredients include rice, poultry meal, maize, poultry fat and vitamins and minerals…..Yummy! It typically consists of at least 25% protein. Spike’s semi moist. as the name suggests, is a much softer food but not at all slimy. It feels a lot like a stock cube consistency. The list of ingredients include meat and animal derivatives, cereals, various sugars, oils and fats, yeasts and minerals. There are also a bunch of other vitamins and nutritional additives too. I wanted to devise a way to find out exactly how Spike’s hedgehog food is received compared to the usual food items I offer. After a bit of head scratching, sketching, sawing and hammering the ‘Hog Buffet Bar‘ was born! The shiny new Hog Buffet Bar! The Hog Buffet Bar was made out of a few scraps of timber from around the garden and 4 small stainless steel bowls I purchased for 80p each at a local discount store. 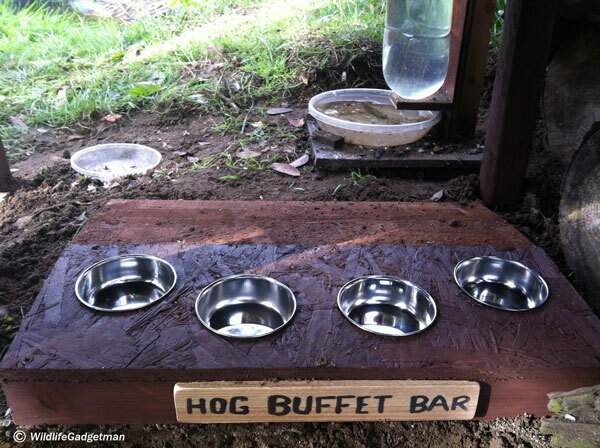 I’ll add a full ‘How To’ guide about how to make your own Hog Buffet Bar as soon as I have time. Since the 16th of September I’ve been providing the following food in separate bowls – Spike’s Dry, Kibbled Peanuts, Spike’s Semi Moist and Sunflower Seeds. I’ve also set up two cameras overlooking the area. One is an HD webcam and is streaming live images across the internet via my my website and the other is a 700TVL mini camera with built in IR nightvision. The 700TVL cam is connected to I-Catcher Console motion detection software so I can monitor exactly what visits the Hog Buffet Bar, what time it visits and how long it stays. On the first couple of nights I used a chicken based cat food rather than kibbled peanuts but the local cats scoffed this down within the first half hour each night so I quickly substituted it for kibbled peanuts. So, what did the hedgehogs make of the food selection? 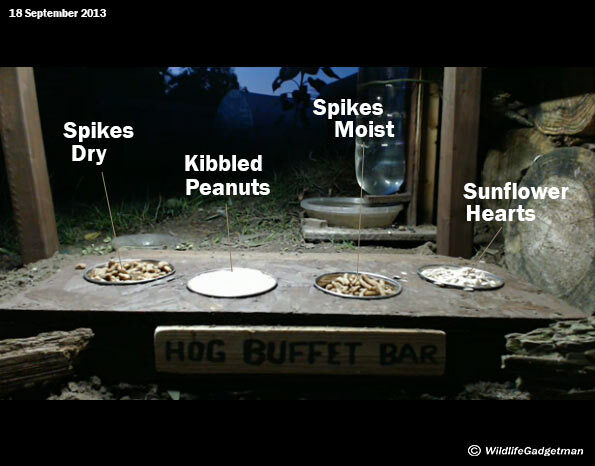 Well, over the past eight nights hedgehogs have visited the Hog Buffet Bar a total of 47 times. It’s difficult to be sure exactly how many hedgehogs are visiting as I try to keep my distance. (I have no intention at this stage to stress them out by picking them up to weigh them or painting ID marks on them but I will be keeping a close eye to make sure they all look a decent weight. I also have my Hog Weigh Station of course with built in scales!). Of the 47 visits, one ate a small portion of sunflower hearts and then moved on to the Spike’s Semi Moist. Two hog visits started with kibbled peanuts……and then moved on to Spike’s Semi Moist (can you see a bit of a pattern developing here?!). Four hog visits were Spike’s Dry food but that may be because the Spike’s Semi Moist had all been eaten during previous visits! And the remaining 40 visits? You guessed it – all Spike’s Semi Moist!! There were three or four visits from the local feral cat and interestingly it went for the Spike’s Dry food every time. The foxes didn’t visit at all during this period and there were one or two extra hedgehog visitors that just had a sniff and carried on their way. So, is the Spike’s range of hedgehog food a hit in the Gadgetman garden? I think you can already guess the answer to that question! It would appear that its been a massive hit with my local hedgehogs. I had no idea how irresistible the hogs would find it. They look healthy, they’re visiting as often as ever and by the amount they are eating they must be putting on weight too! Has my skepticism disappeared? Totally? 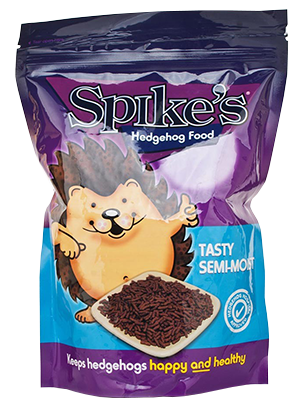 Will I be using Spike’s Hedgehog Food in the future? Definitely. Would I recommend it to others? Without a doubt! I’ve been using Spikes semi-moist food for a year or two in my garden (in Midlothian, Scotland) and the hedgehogs just love it. Since I started using it I’ve had as many as 4 hedgehogs appear at once (usually mid-summer). Tried the dried food but they seemed to ignore it. They also like peanuts and sunflower hearts. I put the food out in separate piles on the patio and use my Bushnell trailcam to record them after dark.